Every drum collector has one. It's the one they've always wanted but can't afford, or the one they've always searched for but never found. It's the ultimate rarity, the stunningly gorgeous eye catcher, the conversation piece worthy of even the most astute enthusiast's attention. And maybe it changes over the years depending on the focus of one's collecting. 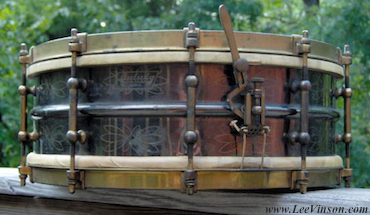 At one point in time my Holy Grail was a Ludwig & Ludwig "Black Beauty" - a popular choice among drum collectors. I bought the drum pictured at right in the Summer of 2007. Dating from the early 1930s, this drum was produced while the company was under Conn ownership and not long before their engraved metal shell drums went out of production altogether. The brass shell is a heavy one-piece version with a factory installed tone control. Both of these elements along with the understated engraving pattern help date the drum roughly to 1932 - 1934, or so the Ludwig experts tell me. 3.) Pearl Covered Master-Model by George B. Stone & Son, ca. late 1920s. 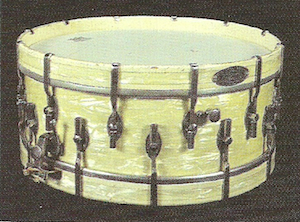 If this one looks familiar, it's because this drum is pictured in Harry Cangany's book The Great American Drums and the Companies That Made Them, 1920 - 1969. Cangany later sold the drum to a collector in Boston. I've met the owner, I've seen his collection, and I've held this very drum in my hands. And I can honestly say that it's real and it's spectacular! I am also aware of a silver sparkle wrapped Master-Model which is presently in the grasps of another collector and, like the marine pearl drum in Boston, is not for sale. So alas, the search continues. Additionally, I have seen two separate pieces of ephemera documenting the existence of a Master-Model with chrome hardware and finished in "red pearl"! So I know that more examples of pearl wrapped Master-Models are out there. If you have one, we should talk! UPDATE: A White Marine Pearl Master-Model has surfaced!!! 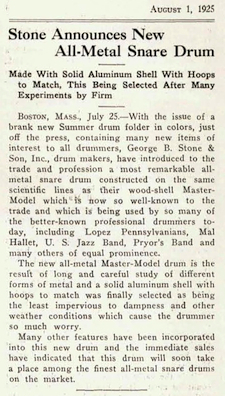 Introduced in 1925 (after the publication of Catalog K in which there is no mention of such a drum) the All-Metal Master-Model was for all intents and purposes a Stone Master-Model built around an aluminum shell rather than the customary three-ply, 5/8" thick maple. Gladly, I can confirm that this drum exists even beyond second hand reports from two other credible collectors and even the press release pictured here. I was contacted about a year and a half ago by an older gentleman who had an All-Metal Master-Model in his possession. The pics he emailed me were cropped and out of focus, but the proof was there. It looked to have possibly been painted but the knobby gold hardware really stood out from the cream colored shell. Unfortunately, our communications broke down and we fell out of touch. But at least I know that there is such a drum to be unearthed. UPDATE: An All-Metal Master-Model has surfaced!!! I'd have to categorize this one as the rarest of the rare in terms of early 20th century Boston-made drums. It's little more than a myth to me really, but a very noteworthy collector claims that such a drum does in fact exist and that he has seen it with his own eyes. The tale of his encounter with this drum is amusing if nothing else as it involves an old-school curmudgeon living out of an un-airconditioned RV in the dead of summer at a swap meet. This all leads me to wonder exactly how credible the account really is. But what do I know? I wasn't there. In support of his claim, Stromberg was known for his high degree of craftsmanship and ornately detailed examples of Stromberg guitars and banjos are well documented. So if by any wild chance you happen to come across one of these three drums, please get in touch with me! We'll work out a deal. And I promise you that no one will be more thrilled to bring in one of these instruments. As always, you can reach me by emailing lee@vinson.net.